What Are the Uses & Benefits of Turmeric? Who Can Benefit From Turmeric? How Do I Take Turmeric? How Do I Pick a Good Turmeric Product? In order to help you find a good product we’ve researched & narrowed down the best turmeric supplements on the market right now. 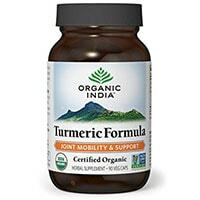 Organic India Turmeric Formula is a 100% organic whole root supplement that is fortified with curcuminoid extract and stacked with ginger for optimum efficacy. It does not have harmful fillers, and the capsule is organic and veggie based. This product is vegan, vegetarian and gluten free, and it does not use any GMO products. Organic India is a health and wellness company that was started in the 1990’s by students of a spiritual teacher named Poonja in a town called Lucknow in Northern India. The students were from around the world, and had traveled to learn about the search for truth and self-realization from Poonja. Inspired by his teachings, they decided to work together to establish a sustainable business model that would lift thousands of Indian farmers out of poverty and simultaneously produce organic health products to improve the lives of consumers around the world. The formula is more bioavailable than other turmeric supplements, containing turmeric extract standardized for curcuminoids, and it is very affordable. No matter what turmeric benefits you are after, this supplement will do the job. 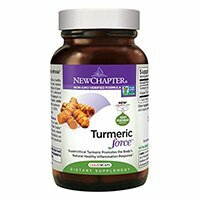 New Chapter Turmeric Force is a daily turmeric pill that provides you its anti-inflammatory properties. It is a whole turmeric product that provides you hundreds of beneficial compounds found within the plant at a good dose of turmeric. Some of these compounds include curcuminoids and turmerones, which are both important compounds to turmeric bioavailability and benefits. Without any synthetic fillers, GMO’s or artificial ingredients, this wholesome product is a good choice if you need turmeric. New Chapter is a natural health brand that focuses on natural, whole food solutions to health. They have been around for 35 years promoting natural health solutions and improving customer’s overall wellness. They use sustainable sourcing practices, climate-friendly farming techniques, and they are responsible with their waste – they compost, recycle, or reuse more than 80% of it! One of the unique aspects of this product is that it has superior bioavailability without the addition of black pepper extract due to the concentration of beneficial compounds that synergistically improve absorption. It also has the benefit of being a single pill dose per day, making it an easy addition to your daily routine. 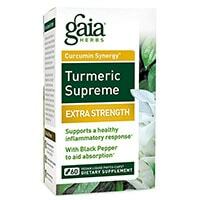 Gaia Herbs Turmeric Supreme Extra Strength is a highly rated turmeric supplement that boasts bioavailability, affordability and efficacy. It is an extra strength turmeric pill that is formulated to be effective in a single dose per day. Its improved bioavailability comes from being fortified with black pepper extract, which studies have shown improve absorption of the beneficial compounds in turmeric. Gaia Herbs alcohol-free liquid turmeric extracts are encapsulated in a quick releasing gel capsule that also supports its efficacy. This pure formula is also gluten and dairy free, as well as 100% vegan. Gaia Herbs is committed to purity, integrity and potency in their products. Their original products were highly concentrated liquid extracts derived from plant sources, which they specialize in. This makes their liquid extract products potent and better absorbed than other plant based supplements. They always test their products for purity as well, ensuring that you know exactly what is in your supplement. This product provides you all the turmeric benefits the herb has to offer, but in a more potent turmeric pill fortified with black pepper extract. Made by a reliable brand, it is also gluten and dairy free, as well as 100% vegetarian. 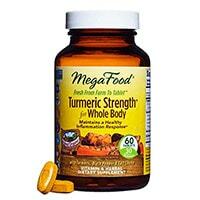 MegaFood Turmeric Strength For Whole Body comes in the form of a tablet. It is fortified with vitamin C, a blend of antioxidant rich fruits, holy basil leaf extract and black pepper extract. Their garden harvest fruit blend provides additional antioxidants from a variety of compounds in colorful berries which help improve turmeric’s benefits. MegaFood is a health and wellness brand dedicated to improving the lives of their customers. They are committed to only making products that provide real food health benefits. Since 1973, they have been using products from family owned farms. They are even partnered with scientists at the University of New Hampshire to help them provide the best, most effective health products on the market. Bursting with antioxidants and natural anti-inflammatories, this formula provides highly effective turmeric benefits in a dosage of two tablets per day. 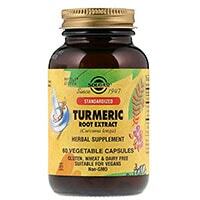 Solgar Standardized Turmeric Root Extract is a single turmeric pill that you can take daily for its turmeric benefits. It is affordable, vegetarian, non-GMO and free of gluten, dairy, soy, wheat and yeast. Manufactured by Solgar, one of the oldest and most trusted supplement brands, it has a great reputation. If you are looking for a turmeric product that is basic, effective, and only a single dose per day, this may be a good option for you. They employ what they call the Solgar Gold Standard of manufacturing to all their products, resulting in consistent quality control and superior products. 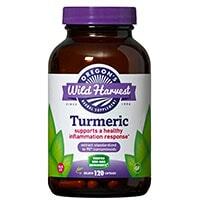 Oregon’s Wild Harvest Turmeric is a vegetarian turmeric pill that provides the full spectrum of turmeric compounds, both from pure turmeric rhizome and standardized curcuminoid turmeric extract. It is fortified with black pepper fruit extract, giving it superior bioavailability and absorption. It also is free of common allergens, such as dairy, wheat, gluten, soy, peanuts, and corn. The capsules are entirely vegetarian, and made from a single ingredient. There’s no unnecessary fillers here. Oregon’s Wild Harvest is a natural health and wellness brand that was launched in 1994 by Randy and Pam. Randy was a registered surgical nurse for over 20 years. This is an effective turmeric option that provides anti-inflammatory and antioxidant benefits of turmeric. It is also made by a reliable company with quality ingredients. However, it does take three pills per dosage, and it is more expensive than some alternatives. Source Naturals Turmeric 1000 is a turmeric tablet that includes a high dosage of curcuminoids, which have been extracted from the turmeric rhizome (root). It also includes black pepper extract and bromelain to improve the efficacy and bioavailability of turmeric. Source Naturals is a natural health brand that was founded in 1982. They pioneered the concept of combining herbs, nutraceuticals and nutrients with their Wellness Formula. They have a holistic approach to health that combines alignment, balance and nutrition for improving overall health and wellness. This is a powerful turmeric supplement formulation that provides a high turmeric dosage fortified with black pepper fruit extract and bromelain. However, it lacks a variety of turmeric compounds because it is standardized for curcuminoids only, and it uses more fillers. 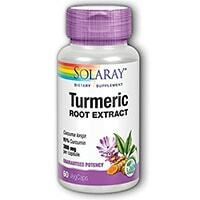 Solaray Turmeric Root Extract is a turmeric pill that is made with vegetarian capsules. It is a one-a-day formula that is standardized for 95% curcuminoids to improve efficacy and absorption. 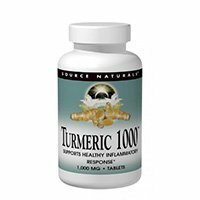 This turmeric pill is manufactured by a reliable and trusted brand that has been in the supplement industry for a long time, and they even guarantee potency. It is also GreenScreen certified, which means it is a certification that ensure the product uses safer manufacturing chemicals. Solaray is a nutraceutical company that is passionate about making healthy products. They are vertically integrated, which means they are responsible for all of the manufacturing, distributing, marketing and selling of their products. This makes them involved in every step of the process, and able to control quality more effectively. It also allows them to offer effective products at affordable prices! 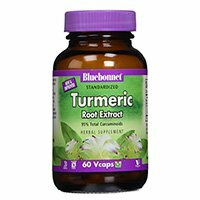 Bluebonnet Nutrition Standardized Turmeric Root Extract is a turmeric pill that is standardized to be 95% curcuminoids. It is a one pill per day dosage inside of a vegetarian capsule. The gel capsule is quickly digested for easy, fast release of the turmeric extract. It makes a great supplement for those looking for a simple turmeric formula that they can easily add to their daily routine. Bluebonnet Nutrition is a 26 year old supplement brand that is dedicated to producing supplements that are “as close to nature as possible.” Their products are mostly farm-to-table, USDA organic whole food based supplements. This is a good choice of turmeric because it offers a simple, effective one-a-day formula. However, it uses a standardized extract for curcuminoids, and does not include additional turmeric compounds. It also uses some more fillers than some alternatives, and it is a bit more pricey. Nature’s Answer Turmeric-3 is a turmeric extract that includes a concentration of three important turmeric compounds, called curcuminoids. The extract is alcohol free and holistically balanced. Taken as drops of turmeric extract, it is entirely pure and potent. Nature’s Answer, established in 1972, is a natural supplement brand that provides products based off of holistic health methods. They both manufacture and package their supplements, so they guarantee the highest quality and purity. 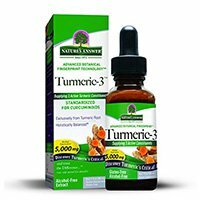 Nature’s Answer Turmeric-3 is a concentrated turmeric extract that comes in the form of drops. It is potent and pure, because all you are taking is pure turmeric. However, it comes in a low quantity of servings, and the dosing is much less convenient than tablets or pills. It also provides a lower turmeric dosage. Inflammation is the basis of many health issues and diseases. It is the body’s response to perceived threats, in which white blood cells attack foreign invaders. Extra blood in the area causes redness and swelling, which can cause arthritic conditions when localized in your joints. Those with arthritis and other inflammatory conditions can benefit from a specific natural supplement. Turmeric, a root, can help to reduce pain, swelling and inflammation do to it’s anti-inflamtory properties. It is a member of the ginger family, and the root looks very similar to ginger root. The plant has tuberous underground stems known as rhizomes. Like ginger, it is used in Asian cooking as one of the main spices in curry. Food sources of turmeric include anything you spice with it! Indian ayurvedic medicine has also utilized turmeric as a medicinal herb. Overall, turmeric has been used for at least 4,000 years for human purposes. Turmeric is a herb that is well known for fighting inflammation. It’s commonly used in various world cuisines, and has also been extensively studied for its potential benefits (in fact, there are over 10,000 peer-reviewed studies looking at turmeric and curcumin, the active compound found in turmeric. Inflammation: Perhaps the best-known benefit of turmeric is its effect on inflammation. Curcumin, the active compound in turmeric, helps to keep inflammation at bay in the body. It’s so effective it was actually noted as being more effective at controlling inflammation than ibuprofin or aspirin. The anti-inflammatory effects of turmeric are responsible for many of the potential disease-fighting and health boosting benefits of the herb. Antioxidant: Curcumin is a potent antioxidant, meaning it helps to fight damage caused by free radicals. Antioxidants contribute to various aspects of our health by protecting our cells from damage. In addition to its own antioxidant content, turmeric may also help to boost the body’s natural antioxidant enzymes, although these effects have mostly been observed in animal studies. It’s worth noting that curcumin only makes up about 3% of turmeric by weight, so it’s best to take an extract with a higher curcumin concentration. Disease: The potent anti-inflammatory and antioxidant effects of turmeric may help to ward of diseases including heart disease, cancer, Alzheimer’s, metabolic syndrome and more. It is established that chronic inflammation can contribute to the development of these diseases, and curcumin is effective at curbing inflammation. Curcumin is effective at blocking NF-kB, a molecule that is believed to play a major role in inflammation and many chronic diseases. Thus, it is thought that turmeric and its active compound of curcumin may be beneficial in lowering the risk of certain diseases – although researchers warn that turmeric is far from a cure-all. Brain Function: It is thought that curcumin is able to boost brain-derived neurotrophic factor (BDNF) levels in the brain. BDNF is a growth hormone that is important for forming neurons and new cells in the brain. Low levels of BDNF have been linked to depression and Alzheimer’s disease, among others, so there is a possibility that the BDNF-boosting properties of curcumin may help to improve brain function and lower the risk of various brain diseases and age-related brain function decreases. Animal testing has produced very promising results, but more human trials are needed to confirm these results. Heart Health: Heart disease is the #1 killer in the world, so researchers have dedicated significant time and effort into studying this deadly disease. Initial studies have found curcumin to have some protective effects on the heart in regard to heart disease. It is thought that curcumin may help to improve the function of the endothelium, the blood vessels’ lining system. Endothelial dysfunction is a notable driver for heart disease, so it is thought that curcumin’s positive effect on endothelial function may help reduce the risk of heart disease. Arthritis: Curcumin has been shown to positively affect symptoms of arthritis. This is due to the potent anti-inflammatory effects of the herb. One study found that curcumin was even more effective for osteoarthritis than a well known anti-inflammatory drug. Overall, turmeric/curcumin has a host of potential benefits and is well received by most people with minimal side effects. It’s worth noting that curcumin can be difficult to digest for some people. It’s recommended that you look for supplements containing black pepper (Bioperine), as this can greatly increase the absorption of curcumin. Those with Arthritis – Research has shown that turmeric’s anti-inflammatory benefits can help to treat the underlying cause of arthritis, as well as offer natural and safe pain relief. There are two forms of major arthritis – osteoarthritis and rheumatoid arthritis – and they both cause pain and stiffness of the joints. Osteoarthritis is the most common form of arthritis, and it occurs through the deterioration of cartilage between joints; often from wear and tear and aging. Rheumatoid arthritis is an inflammatory autoimmune disorder that is caused by the immune system attacking joint tissues. Turmeric dosages of 400 to 600mg standardized turmeric three times a day have been shown to be effective at helping to treat osteoarthritis. Standardized turmeric dosages of 500mg two times a day have been used for improving rheumatoid arthritis. Those with Digestive Issues – Turmeric can help to treat digestive issues such as gas, indigestion, heartburn, Irritable Bowel Syndrome (IBS) and Inflammatory Bowel Disease (IBD). Natural compounds in turmeric help to prevent over-production of acids that can cause gassiness, and helps to treat abdominal pain that can go along with gas. Turmeric is also a natural source of magnesium and potassium, which can help to treat diarrhea. One study found that turmeric supplements reduce mucosal injury in acid-induced forms of colitis, which is an IBD that results in inflammation of the colon lining. Older Adults – Turmeric can help to treat and prevent many common health issues that arise when we age. Arthritis and digestive issues both fall under this category. On top of this, turmeric is a powerful antioxidant. Antioxidants are compounds that protect cells from damage, and they are beneficial to older adults because they help to reduce oxidative cellular damage that contributes to aging according to the free radical theory of aging. This means that antioxidants can help slow the aging process. Turmeric supplements contain powerful polyphenols and curcuminoids that fight free radical damages to your cells. Those with High Cholesterol – Turmeric may be a good supplement for those suffering from high cholesterol. Studies on animals have suggested turmeric can help reduce LDL cholesterol, total cholesterol levels and triglyceride levels in the blood stream. Currently there are not many studies that have been conducted on humans, but the polyphenols in turmeric are already known to be beneficial to the cardiovascular system. Athletes – The pain reduction and anti-inflammatory turmeric benefits sound like the perfect aid to athletic recovery, right? Turmeric supplements can help to reduce soreness and inflammation that goes along with intense exercise. Some studies also suggest that turmeric can help to improve recovery speeds due to its curcumin content. One study found that mice taking curcumin experienced full muscle recovery 4 days after muscle damage, with the control group taking 20 days to experience full recovery. Turmeric can help to improve your athletic recovery and training overall. Turmeric is a very safe natural supplement. However, some people do experience side effects. These side effects may include nausea, stomach upset, diarrhea etc. The forms of turmeric include turmeric pills or capsules, tinctures, extracts, teas etc. Different doses of turmeric may be better for different purposes of supplementation. The most common dosages range from 1 to 3 grams powdered root per day, or 400 to 600mg three times per day standardized powder. Tinctures are recommended at 15 to 30 drops, four times daily. Turmeric is also fat soluble, so it is best to take it with a source of fat.